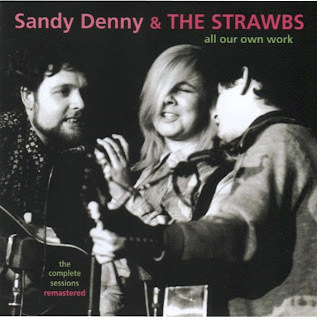 All Our Own Work dates from Sandy Denny’s early years – pre-Fairport, Fotheringay and the solo years – and with this new edition (released on the Strawbs’ own label, Witchwood Media) its full story can at last be told. It was originally only released in 1973, to cash in on Sandy’s solo success and, more specifically, on the Top Ten presence of Strawbs’ “Part of the Union”. Sandy joined the group in 1966, when they were still known as The Strawberry Hill Boys, touring the club circuit as a bluegrass-influenced folk duo. The tracks were recorded in Copenhagen in July 1967. Previous issues of the music have stated it was 1968, which has led to some confusion in chronicling her movements at this formative stage in the careers of all involved. The Witchwood CD contains remastered version of the original 12 tracks, plus nine more outtakes and demos (including a beautiful version of “Two Weeks Last Summer”, a Strawbs song which Denny eventually took into the Fotheringay repertoire), and three unheard tunes including the decidedly uncanny “Pieces of 79 and 15”. Sonet was not distributed in the UK, but while Cousins was shopping it around to domestic labels, Sandy apparently played the tapes to Joe Boyd, who persuaded her to join the singer-less Fairport Convention instead. So there was no longer any working Sandy & The Strawbs for anyone to sign. For more on this record, see my review in the forthcoming August issue of Uncut. By the way, the BBC recordings mentioned by Cousins are also being released in July, in two volumes by Universal. Seven studio sessions between 1968–73, and a disc of live material from 1971–4. Very interesting, Rob. Thank you. For a slightly different take on events, see my Sandy blog. I think the problem is that when we come along forty years on and benchmark people’s memories against known historical facts, we find they’ve telescoped events which may have happened six months or a year apart. I’m sure that’s true at several points in White Bicycles (e.g. Boyd’s story about Paul Simon). The BBC sessions mentioned by Cousins were from the time he met Sandy Denny, i.e. from 1966/67. So they can't be the sessions recorded from 1968 on that were released by Universal.